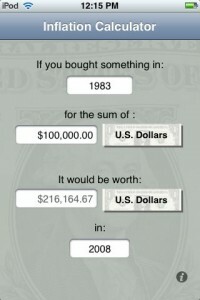 Have you ever wondered how much that nickel candy that your grandparents are always telling you about would cost today? Or what the $5,000 dollars you spent on your first new car would be equal to today? Integrity Logic and their app Inflaton will tell you just that. You just enter in the amount you spent, the year it was spent in, and the currency used. 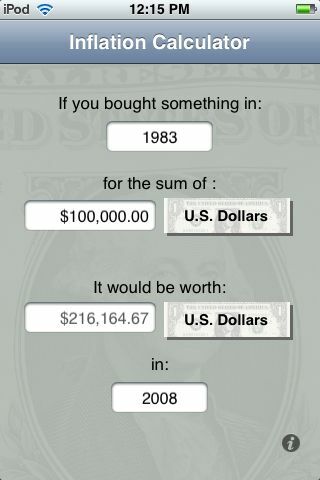 The app quickly calculates the modern equivalent. Curiosity satisfied. This app will make calculations in US Dollars, Canadian Dollars, UK Pounds, New Zealand Dollars or Pounds, and Australian Dollars or Pounds. To make their calculations, the app uses official data published by the government of each country on inflation rates. The makers of the app claim that while they don’t promise 100% accuracy, there should be a less than 1% margin of error. Inflation is $0.99 in the iTunes App Store.